Hangin’-A-Round is played on a 12'x12' square field. Two alliances - one "red" and one "blue" - composed of two teams each, compete in a match. 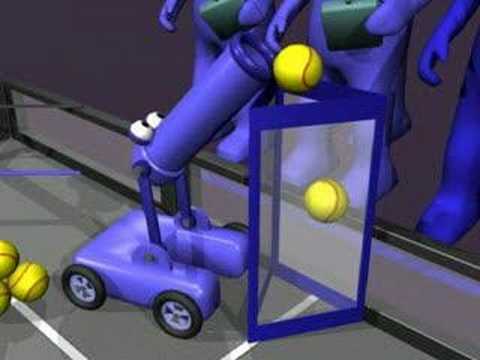 Matches consist of a twenty-second autonomous period followed by two minutes of driver-controlled play. The object of the game is to attain a higher score than your opponent alliance by scoring softballs into low goal or tall goal. In addition, an alliance can earn additional points by “parking” on the large rotating platform in the middle of the field or by hanging of the bar. The large yellow Atlas Ball would double the alliances points if it was mostly on their side. A bonus is awarded to the alliance that has the most total points at the end of the Autonomous Period. With the taste of success still lingering from the rookie season, and the core VEX members graduating or moving up to FRC, new members had to fill some pretty big shoes. The team produced Simbot “K-OS”. With a World Championship victory fresh in their mind Team 1114 had a lot of work to do for the season. A Gold Medal at the Ontario FVC Championship qualified Team 1114 for a trip to the World Championships in Atlanta, Georgia and was ultimately crowned World Champion for the second consecutive season. This established Simbotics as one of the most world renown VEX teams in only the second year of existence.